Praia Nova Village was one of the most affected neighborhoods in Beira. 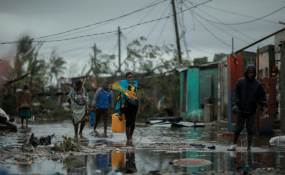 A week after the Cyclone Idai hit, the extent of devastation is still unclear. The government disasters body said today that 90,000 people are now in 109 accommodation centres. (bit.ly/MozCyclone10) But many were able to walk to schools and other public buildings being used as accommodation centres in Beira and Dondo, after their houses were destroyed. Uncounted tens of thousands of people are still stranded in the huge rural flooded area, many without food for the past week. Rescue is largely by local canoes and fishing boats. World Food Programme has a warehouse in Beira, but it was largely destroyed in the cyclone and much of the food lost. It is using the food that survived to feed about 4000 people a day in Beira and Dondo, according to Gerald Bourke of the World Food Progamme. (Listen to the interview by Borges Nhamire on bit.ly/MozCyclone11 ) South African and Indian military planes and helicopters are also dropping food to stranded people. Beira is still cut off and only accessible by plane or boat. A ship with 25 containers of donations from Maputo should arrive tomorrow night, and some food is being flown in. But because they do not know the scale of the disaster, "we don't know what the needs are," admitted Bourke. But he stressed it is "beyond the means of any country to solve alone." International help is essential and the "recovery effort is going to take months". Flood waters will continue to fall in the Pungue and Buzi rivers, according to the daily national hydrology bulletin issue this afternoon, but remain above flood levels. Election registration, which was due to start on 1 April, has been delayed indefinitely, until there are acceptable conditions in flood and cyclone affected areas, the National Elections Commission (CNE) announced this afternoon. It also opened the possibility of delaying the elections, but said they must be held this year. Carte de Moçambique today reported that the CNE gave the Council of Ministers three choices: continue with the present date of 15 October, or delay to 15 November or 15 December. The last will be particularly difficult because it is in the rainy season. Changes in the electoral law and calendar will be needed. Copyright © 2019 Mozambique News Reports And Clippings. All rights reserved. Distributed by AllAfrica Global Media (allAfrica.com). To contact the copyright holder directly for corrections — or for permission to republish or make other authorized use of this material, click here. Mozambique: Is This The Start of Serious Crackdown on Heroin Trade?